New on the Menu: Pungent Shrimp! Pungent Shellfish: Cuba’s new specialty. 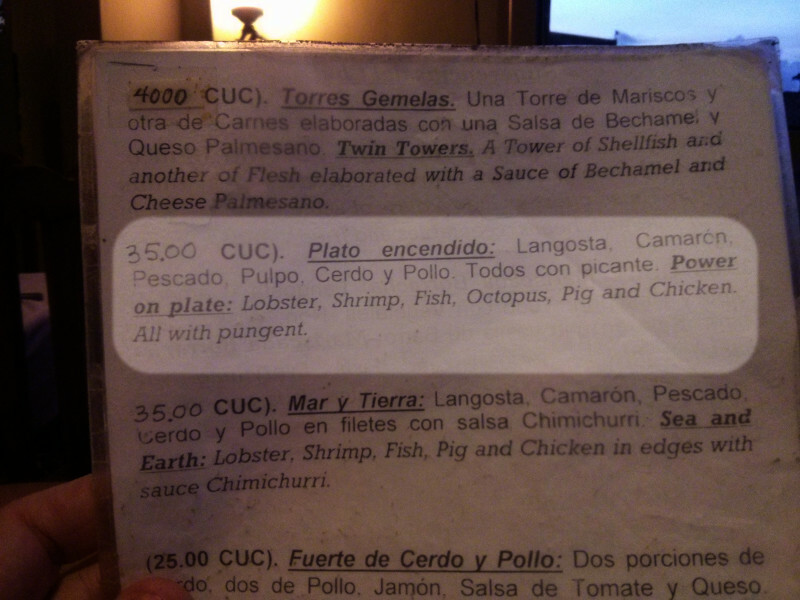 This was the menu for our “fancy” dinner on our honeymoon in Havana, Cuba in April. I rarely point out translation errors to restaurant staff, but this one was serious enough I decided to point it out. But they didn’t seem to care. Perhaps they didn’t grasp the meaning their bad translation was conveying. No hablo español: How I failed to learn Spanish. Twice. A person who speaks more than two languages is a polyglot. So what do you call a person who speaks just one language? The joke is funny because it contains an element of embarrassing truth. And one big reason it’s true is that learning a second language can be very challenging. It was for me. I failed at it. Twice. I did not want to learn Spanish. Or any other language. But my freshman guidance counselor encouraged me to take a foreign language course. In the state of Kansas, students who completed two years of foreign language study were eligible for a scholarship of $1,000 to a state university. I was a freshman. I didn’t care about university scholarships. Plus, $1,000 wasn’t very much money. Especially when you consider the number of boring hours I’d spend in class and doing homework. I actually did the math, and I estimated my hourly earnings to be less than one dollar per hour. I was not sold. Three days into my freshman year, I dropped the Spanish class and switched to an independent study in computer programming. I’m sure I made the right decision. 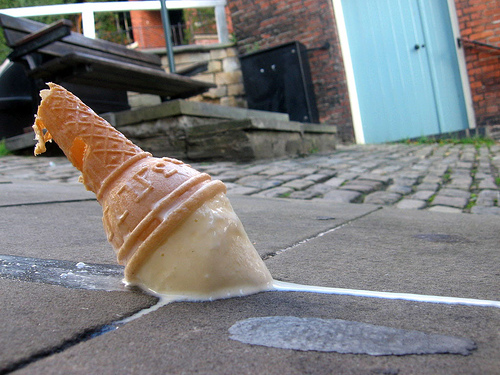 Fallen ice cream: The reason I wanted to learn Spanish. Two summers later, my church youth group took a one-week trip to Brownsville, Texas along the U.S./Mexican border, and we crossed over into Matamoros, Mexico a few times. This was my first “real” exposure to the Spanish language. And it was there that I decided I wanted to learn Spanish. I remember the specific moment. I had ordered an ice cream cone and was fumbling with my wallet to pay for it when the ice cream fell off the cone and landed on my foot. The girl who had just sold it to me giggled. I felt foolish, but I also knew I wanted to be able to talk to her–if only to say something to try to save face. I finally had motivation to learn Spanish. When the summer ended, I eagerly enrolled in an introductory Spanish course at the local community college for dual credit. I eagerly did my homework and passed the semester with a high B grade. Eager to continue my education, I enrolled the following spring in Spanish 102. This time my grade was a low C, and I felt it was unacceptable. I decided to take my second semester of Spanish again, this time at a larger university, with the hope that I could master the material. Again, another C.
Now, of course, I could have continued on to the next level of Spanish, and the school would have been okay with this. But remember, I was taking Spanish classes because I wanted to learn Spanish. I wanted to communicate, not just get a passing grade. And I was failing on that count. I was discouraged, and I gave up. 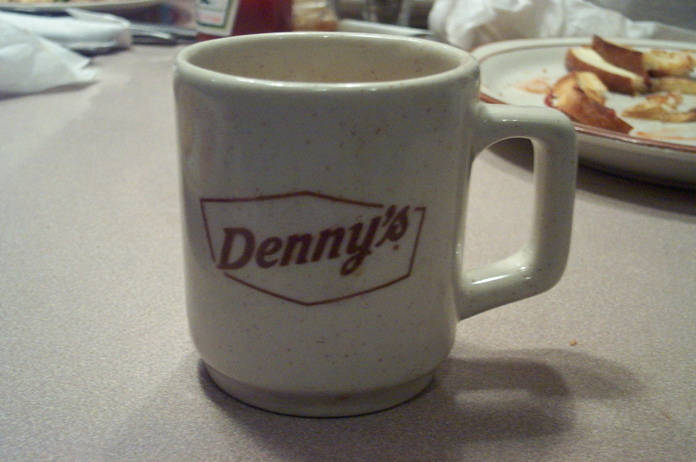 Denny’s was my language school. Several years later I was waiting tables when I noticed one of my regular customers was conducting individual Spanish classes right there in the restaurant. Could this be my chance to try again? I inquired, and she agreed to teach me the language as well. For several months, I met with her, usually two hours every weekend, and I made great strides in my Spanish acquisition. We went over vocabulary and grammar, and I translated children’s books to and from Spanish. To this day she says I was one of her most determined students. But then I got a job in another city and was no longer able to attend classes with her. Quickly I forgot practically everything I had learned. In 2010, my work changed again and gave me the flexibility to work remotely, so I took the opportunity to move to Mexico, where I would be able to focus even more on learning Spanish. I enrolled in a local Spanish school and settled in for the 9-month course. I had to start at square one. Practically everything I had learned before was forgotten. Although the first month or so of the course was relatively easy for me, as old knowledge started to come back to me, it was discouraging how little I had retained from before. When the course ended, I passed with good marks. But I was not fluent. I spent another year in Mexico after the language course ended, and it was during this time that I would say I truly learned Spanish. Going out with friends, conversing one-on-one, and chatting with online penpals are the things that most helped me learn Spanish. So when I decided I wanted to learn Portuguese to visit a friend in Brazil, I started teaching myself, using the same techniques I had used to learn Spanish. When I then went to Brazil in 2014, after studying Portuguese on my own for about a year, I found that my spoken Portuguese was absolutely abysmal. I had only been teaching myself to read and write Portuguese. The month I had there helped immensely to remedy that situation, but mainly it taught me many of the flaws in my self-teaching techniques. Later in 2014 I spent three months in Portugal, as well. This gave me more opportunity to hone in my Portuguese skills, and more importantly, my language-learning techniques. Now I’m teaching myself French. During this entire process, I have succeeded in learning to speak Spanish. It was definitely a challenge, but I succeeded. But what is more exciting to me is that I have learned how to learn a language. And while there will always be new techniques to language learning, I believe I have picked up enough of this essential knowledge that I can begin to share it with you. That is why I have created this blog. And I hope you’ll follow along. 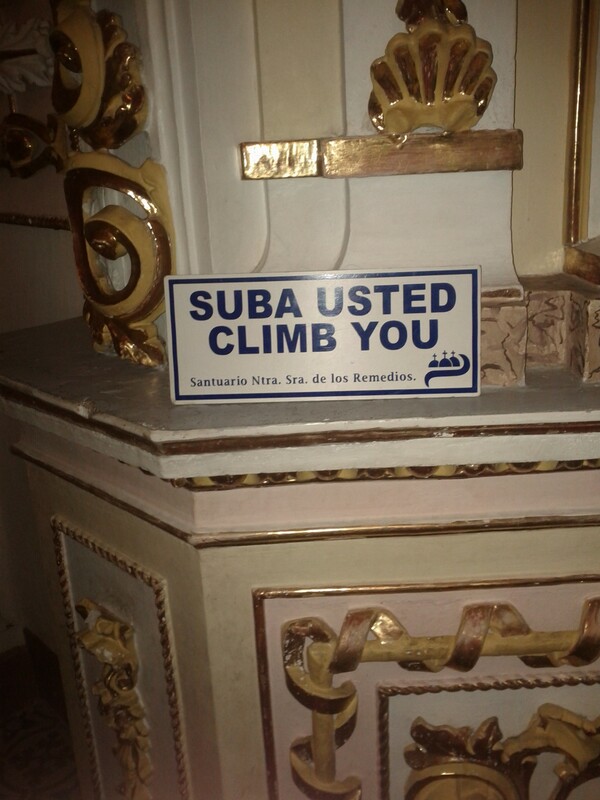 This sign, found in the church atop the Pyramid of Cholula near Puebla, Mexico, was meant to indicate that visitors must take a few steps up to exit the room. But the subtle difference between “to climb” and “to go up” were clearly lost on this translator, not to mention word order!